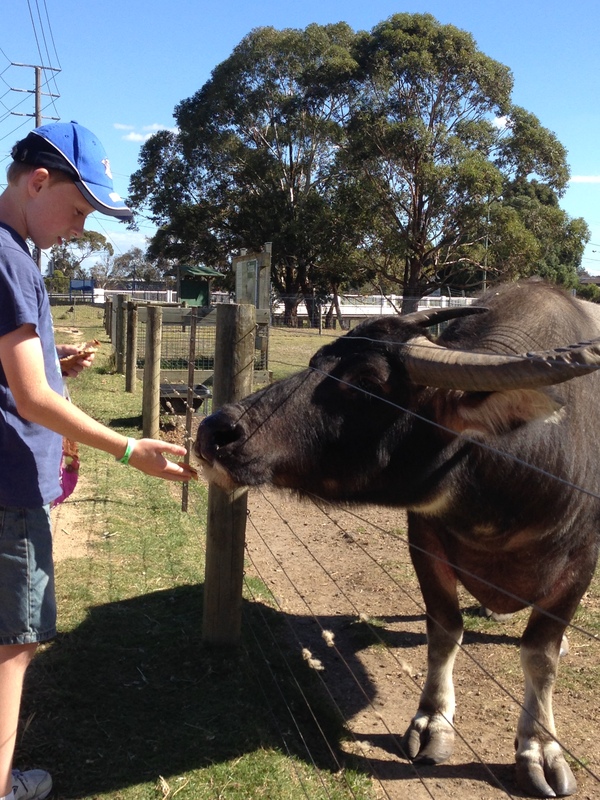 This is me feeding an Asian buffalo. Check out those horns! Today I want to write about a really cool, powerful animal, the Asian buffalo. These massive animals can grow up to 3 metres long, 1.9 metres tall and weigh up to 1,200 kg. Asian buffaloes have the longest horns of any bovid, a family of animals that includes cows, bison, buffaloes, gazelles, antelopes, sheep, goats and musk oxen. These horns are larger in males than females and can measure up to 2 metres across. Their hooves are very wide, which helps them to walk on soft, muddy ground without sinking. They enjoy covering themselves in mud to protect themselves from the sun. They live in small clans of up to 30 females and young buffaloes, led by a dominant female. Males leave the clan when they get old enough and either live in smaller groups with other males or by themselves. Wild Asian buffaloes are extremely endangered and are only found in small numbers in India, Nepal, Bhutan and Thailand. However, many years ago, they were domesticated and are now found throughout the world, known as water buffalo. It is estimated that there are over 130 million domestic buffaloes around the world and more people rely on them than any other animal, due to their strength for ploughing fields and transporting goods, meat, milk, leather and their poo which is used for fertiliser and fuel. There are also about 150,000 feral water buffaloes in northern Australia where they cause lots of damage to the environment. Are there any other interesting facts that you would like to share about Asian buffaloes? You actually got to touch one of those! Cool! !